Number of processors and cores per processors. Type and performance of the video card. You may need to tune the performance settings of FastRawViewer to be more comfortable. FastRawViewer is optimized for work with files on modern high-speed storage devices: SSD drives, disk arrays (RAIDs), fast flash cards (UHS-I and similar in fast USB3 readers). When using slower media, additional optimization of FastRawViewer may be necessary, because the default settings will not be optimal. While you are moving sequentially from one file to another (using Menu – File – Next File or by selecting the next file through the Filmstrip or Grid), FastRawViewer is decoding the next file ahead, so as to make the transition to the next file faster. When you are browsing through the files in a “random” manner, that is selecting files which are two files ahead or two files behind, the program can’t predict what will be the next file to process. Because of this, it is recommended that one browse the shoot in a sequential manner, which is only logical as in most cases, one wants to look through all of the shots that one made. As was already mentioned for sequential browsing, decoding looks ahead, working in the background, making the whole process smoother, without any delay for reading and decoding files. Hard disk drives, cannot read the data from multiple locations at once: the delays are caused by the time spent on the positioning of magnetic heads. Set 1-3 for HDD (the higher, the more priority will be given to the preview generation over the other functionality of FastRawViewer). This parameter can be lowered (down to zero), which will lessen the load on the HDD. Like HDDs, portable media and network volumes work slower than modern SSD storage devices. FastRawViewer can additionally limit the parallel functionality when working with such devices. On prefetch – the decoding will happen during the file prefetch (this option is available only on 64-bit versions of FastRawViewer). Rarely or almost never – “On demand”. The “On prefetch” mode uses a lot of memory, for example: 20 Mpix JPEG takes up 3-4 MB before unpacking, and 80 MB unpacked (as RGBA); that means a 20-file cache of such JPEGs will take up 1.6 GB instead of 60 to 80 MB. Three video modes are supported, DirectX 9, DirectX 11, OpenGL. If RAW data is processed on GPU (see below) DirectX 9 mode is guaranteed to be the slowest, while OpenGL mode is most of the cases (but not always) the fastest one. Unfortunately, due to the multitude of GPU, driver version, OS combinations, it is impossible to provide some sort of universal recommendations. If RAW data is to be processed on a GPU, try switching between DirectX 11 and OpenGL, if it is to be processed on a CPU – try all three video modes. Minimal/Minimal+ modes – those use as little video memory as possible, but they are guaranteed to be the slowest. Use if the GPU has 512MB or less of video RAM. Optimal mode – provides a balance between performance and video RAM usage. Maximal mode – the fastest one, this mode is recommended if more than 2 GB of video RAM is available. None – all processing is performed on the central processor (CPU), video card is loaded with fully prepared RGB images. All RAW files – all RAW data will be processed on the GPU. However, the first time the file is displayed (on file open) it can be slower, as more data is loaded into the GPU. Note: Consequently, the optimal set of parameters depends on the hardware and software (drivers); but it also depends on your preferred workflow: if you are using inspection tools heavily and/or adjusting rendering parameters often enough, especially if going through iterations, processing on GPU will save you time even if the video adapter is a slow one and the delay associated displaying the file for the first time is longer. No resampling – for large zoom factors, the image will look as if it is constituted of small square tiles. Bilinear resampling – fast, mid-quality method. Bicubic resampling – high-quality method, a relatively fast vast video card is recommended. None – no additional processing is involved. Generate low resolution previews – most compatible method, but relatively slow. Not all of the above-listed modes are available on all video cards. If you have an older video-card, bicubic resampling and artifact suppression may not be available at all. 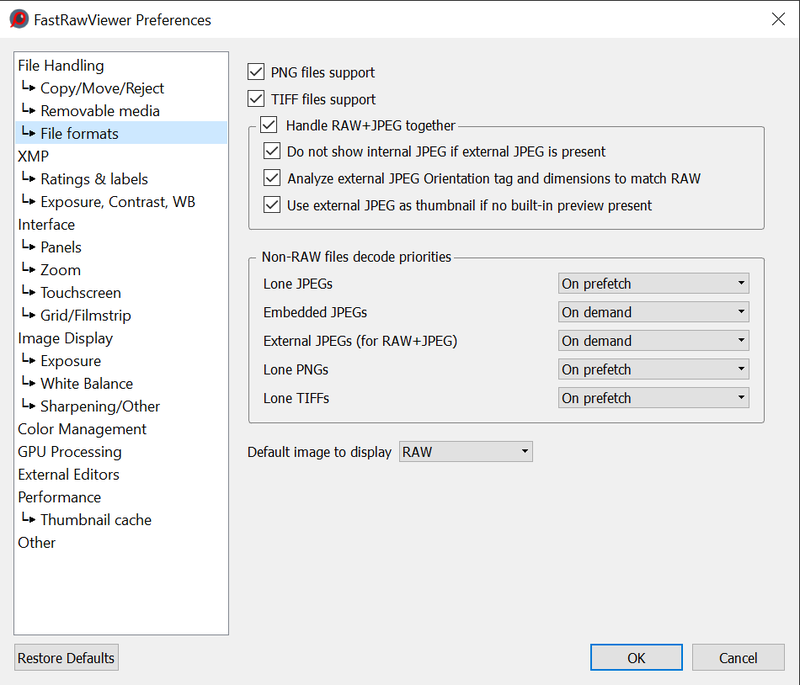 Turn on Preferences – GPU Processing – Image resampling method – Bicubic. 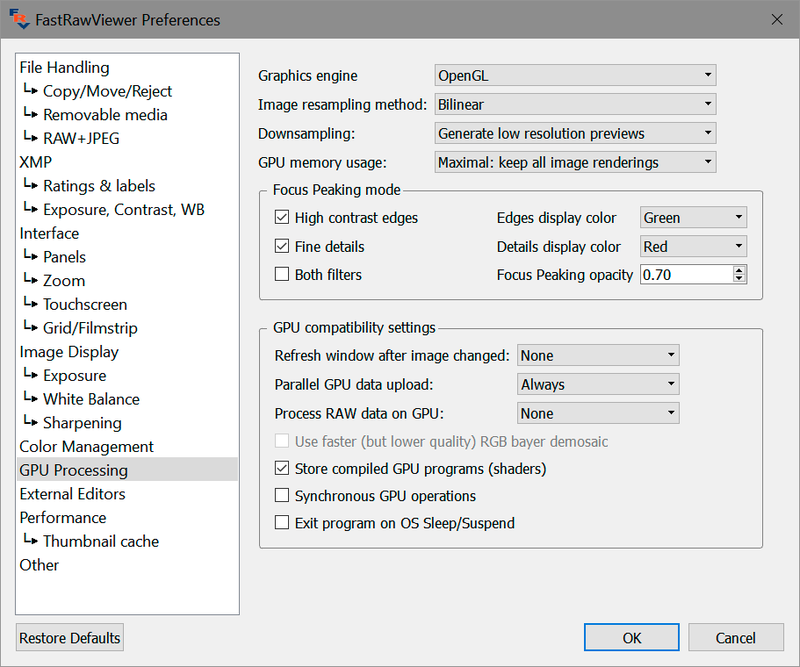 Set Preferences – GPU Processing – Image downsampling to None or to Suppress downsampling artifacts. In this case, the amount of the data transferred into the video card is minimized, and the image display is faster. Synchronous GPU Operations turns on a slower but more stable mode operation for the misbehaving video cards. Slight window resize – the screen refresh is implemented through the slight resize of the window. You may want to turn this mode on if the images on the screen are not redrawn properly. Exit program on OS Sleep/suspend – some versions of Windows XP video card drivers perform an incorrect wake up and FastRawViewer crashes when the computer wakes up after Sleep/Suspend. In this case, you will need to use this mode and start FastRawViewer again each time the computer wakes up.